Successfully Added Tactical Red Laser Gun Sight (Weaver Rail Mount + 3-in-1 Rail Mount) to your Shopping Cart. 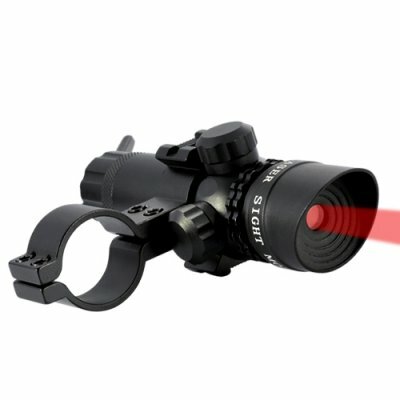 Tactical Red Laser Gun Sight that increases accuracy and includes extra mounting slots for your flashlight, scope, another laser sight, and other handgun accessories. Make each shot count with this Tactical Red Laser Gun Sight. Lightweight and compact, this laser gun sight easily attaches onto your gun through a weaver mount and emits a red laser to your target, guiding your bullet's path and greatly increasing your accuracy. This precision gadget is perfect for hunting, spotting, search and rescue, and of course military/police use. Unique to this Tactical Red Laser Gun Sight is the 3-in-1 rail mount, which allows you to add up to 3 other accessories onto your firearm. Stick a scope, flashlight, and another gun sight on it and use that free hand to firmly grip the pistol, increasing your accuracy even more. Ideal for gun enthusiasts and tactical usage, this Tactical Red Laser Gun Sight is not to be missed. This unique Laser Gun Sight is available in our warehouse right now, so order today and we'll express ship it out to you tomorrow. Be sure to get it before everyone else and reap the benefits in your online store. Brought to you by your source for wholesale electronic gadgets, Chinavasion.